Discussion in 'The Sound Hound Lounge' started by lemonpaul59, Apr 21, 2016. Long time fan, since way back in the early 90s. I hear so many long time players in his playing. A dash of Dexter Gordon here, Turrentine there, a heavy dose of Michael Brecker here, and an occasional Coltrane-esque honky squeally. The melodic nature of Cannonball might be the most prevalent aspect of his playing. I recently picked up a Mike LeDonne CD, with Alexander and Peter Bernstein on guitar. Jazz just doesn't get better. Great rendition of Bernstein's "Bones", I just love it. I need to check him out. Brecker was an absolute monster. First time I saw him was about 1992 or so. He brought his band to a small venue in Boulder Colorado. On guitar...Mike Stern, was the first time I'd ever heard of him. On piano, Joey Calderazzo, also the first time I'd ever heard of him. As you can imagine it was an amazing concert!!! I've really gotten into this sax player out of the Netherlands, Tineke Postma. Her album The Dawn of Light was the first of hers I bought. Also has a song with Esperanza Spaulding. A much younger sax player I just started listening to is Roxy Coss. Here latest release is excellent. I just went to see George Coleman at Smoke in NYC. Mike LeDonne was on piano. Amazing show. Just incredible. Peter Bernstein showed up after to hang out with those guys. That crew is just out of this world. There are times I actually miss NYC. The night you describe could have been one. Not sure what I'd think of seeing Peter without guitar. He's my #1 favorite straight ahead jazz guitarist, with much love to Benson, Bruno and Martino of course. I got to see Peter with Larry Goldings and crew last year at Yoshi's. Hope to see him with Brad Mehldau some day soon. I think you might enjoy some of Brecker's mid to late 90s work, especially with McCoy Tyner. Calderazzo is a great pianist too, I've a couple of his CDs. 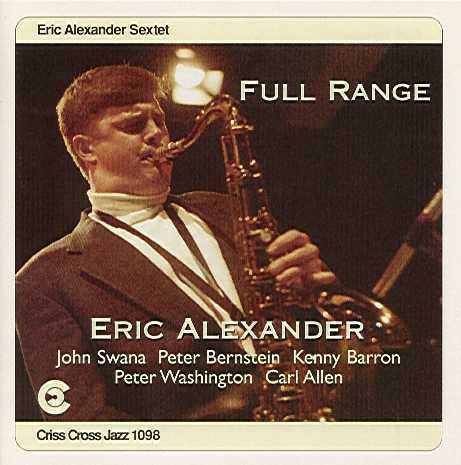 Eric Alexander is a bit more of a pure straight ahead player than was Brecker. Fat gorgeous tone, at times reminds me of Stanley Turrentine, other times very firey like Brecker. My favourite as well. When I heard his CD being played at a record store in the mid 90s, I bought the copy. Peter is also my favorite straight up jazz player these days. He's just an endless well of great ideas and beautiful tone. My guess is he came straight from whatever gig he had that night, hoping to catch the last bit of George's set. Even that was cool to see. I also saw him with the Goldings trio years ago. It was a revelation. A good friend of mine who happens to be a great jazz organ player had the chance to play a gig with him a few years ago. He counts it as one of his greatest musical experiences. Been a fan of Breckers since that day and have all of his stuff as a leader since his first disc from 1987. Have you checked out Pilgrimage? It's his last album before he passed and he had been forced to not play horn for a year I think from illness. Then he spent some time getting his chops back and did that disc knowing it was his last. Yeah Calderazzo is awesome. His first album as leader was In The Door. Different songs have Branford, Brecker or Bergonzi on them. Incredible album. I first saw Randy and Mike back around 1974 or so, in Nanuet NY. Tiny bar near the old mall. Sanborn was with in the band at the time. Ever hear the original rendition of "Funky Sea, Funky Dew"? Maybe my favorite Michael solo of all time. He just kills it on the ending vamp.